Hey everyone! From time to time I share a recipe here and love to share the especially easy ones. My time is limited and sometimes I need something quick and simple to throw together in a pinch. Well, in looking for a quick dinner roll recipe, I came upon this goodie. 30 Minute Dinner Rolls. Ooooooo...I was VERY excited and they turned out fabulous and really did only take about 1/2 hour!!! So, without further ado, here is the recipe! Preheat oven to 400F. Mix water, oil, yeast, and sugar together in the bowl of an electric mixer and let it rest for 15 minutes. Add the salt and egg, mix thoroughly. Gradually add the flour. Divide into 12 equal pieces, and shape into round balls. 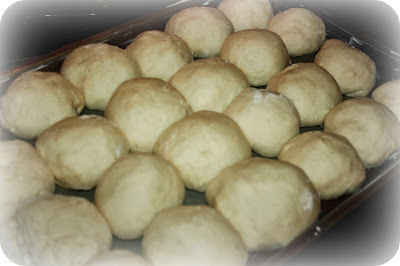 Place onto a greased baking sheet (I used a well-buttered cookie sheet) or silipat and let it rise for 10-15 minutes. Bake 10 minutes or until golden brown. 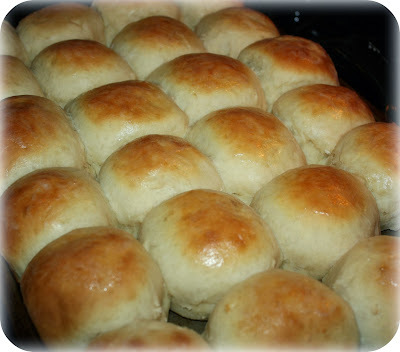 **I rubbed a stick of butter over the tops of the hot rolls as soon as they came out of the oven...it just adds a touch of yumminess and also, keeps them soft. 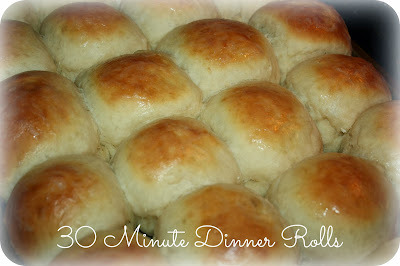 I haven't made rolls in a long time, this is a perfect recipe. And they look sooo good!